What is Personalized Nutrition and Why is it Important? how to personalize nutrition and identify what foods are good for you and what isn't. A guide from Pinto, a team of personalized nutritionist. Personalized nutrition is basically providing food to address the preferences and requirements of a person or group of persons. It involves assessing a person’s genetics, microbes, personal glucose and habits among others and providing them with customized but the right food(s). In personalized nutrition, you should be ready to make conscious decisions to adopt eating habits that correspond with your gene and stick to it as long as it helps improve your health and wellbeing. So How Can I Personalize My Nutrition? This is where Pinto comes in. If you haven’t heard of Pinto yet, Pinto is a New-York based team of nutritionists that have put together a nutrition platform to help individuals understand better the benefits of personal nutrition and how to apply it in your everyday life. And moreover, Pinto has an app that will help you select and identify foods that are best for you. Personalization: Users build a profile around their unique diet and needs -- and then the entire platform adapts around those needs. 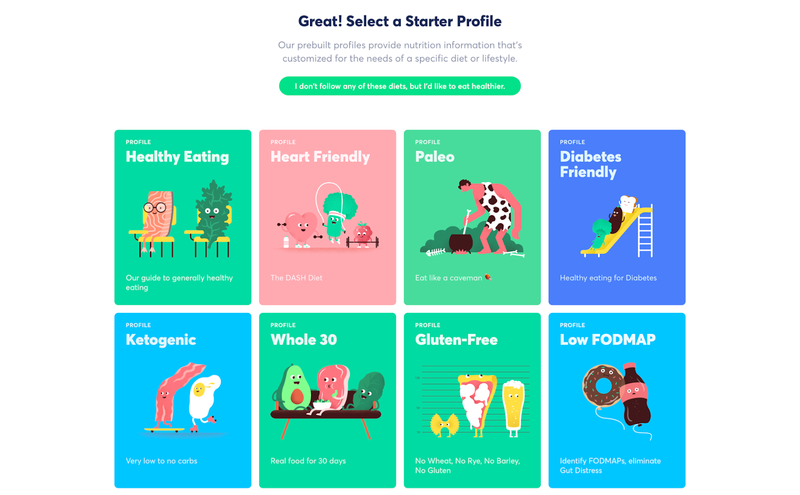 Pinto’s dietitians have created prebuilt profiles that are fine-tuned for common diets and lifestyles and users can also customize their own profile around healthy eating. 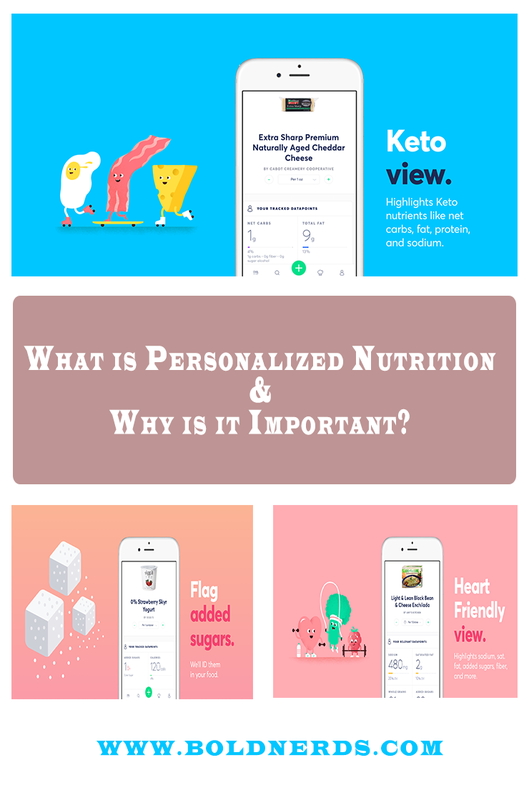 Personalized Analysis / Evaluation (“A Personalized Food Label”): When users look up any food in the system, they highlight the information that’s most important to that user & their diet. For example, a user with Heart Health considerations sees nutrients in focus like Sodium, Saturated Fat, and Fiber (with flags if any of these nutrients are too high/low), while another user on a specific elimination diet sees if the food has any of the ingredients they’re trying to eliminate. They also provide contextual analysis on how well any food fits a user’s dietary needs. Analysis ranges from blue (the top-rated foods for a user) to green (foods that are a good fit), to yellow (foods to have in moderation), to red (foods to minimize or avoid entirely). 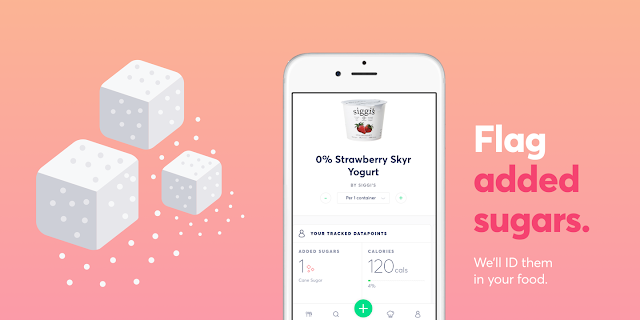 The key tenet here is that -- while there are potentially thousands of data points they could be showing about any given food -- Their goal is to highlight the 4-6 data points that are most important to a specific user. Track Your Daily Diet (the easy way): Pinto give users an easy way to track their diet each day: on the mobile app, it’s as simple as snapping a picture of their meals (and then use image recognition to identify what’s in the meal). 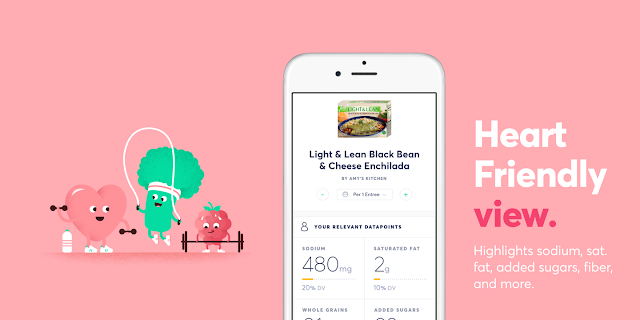 The app then helps the user track the nutrients, ingredients and other food data points that are most relevant to their dietary goals. For some people that will be calories, but different diets need to track data points (for example, sodium is most important on Heart Health, not calories, and people on Low FODMAP need to see if they’ve eaten a given FODMAP on a given day). Personalized Food Finding: They also help users search and filter down to foods that fit their diet in specific categories. For instance, you can scan and find a product that best suits your health condition. Making Nutrition Easier-To-Understand: Pinto also uses data visualization to help consumers better understand nutrition by providing nutrition charts that break down complex nutrient sections. For instance, it shows you more of what nutrients to eat and those to avoid. Pinto also has an innovative way of identifying how much exercise one needs to get done to burn off each particular product. Breaking Down Top Ingredient Concerns: at Pinto, they provide consumers with objective information on the top concerns they have about ingredients. Added Sugars: They classified every added sugar across all products and provide clear added sugar info to consumers. Everything from Coca-Cola (High Fructose Corn Syrup) to Siggi’s Yogurt (Cane Sugar) to less obvious “sugar-having” products like Lentil Soup (Organic Cane Sugar) and Chicken Tenders (Evaporated Cane Juice). Allergies: They classify & tag the most common allergens & intolerances in any food and have also relay the specific troublesome ingredients to the consumer (“what is the soy ingredient that triggered the soy allergy?”). For example, for this frozen meal, a user can click on each allergy tag to see the problematic ingredients. Tricky Ingredients (Additives): For every “tricky” ingredient that is confusing to consumers, their dietitians write consumer-facing definitions that help consumers understand why those ingredients are used in the food. For example, see this product and learn about ingredients like Xanthan Gum and Evaporated Cane Juice (which is really just another name for sugar). GMOs: They also programmatically identify and provide objective GMO information across all products. If a brand has yet to make a disclosure, we flag any high-risk GMO ingredients and communicate them to consumers. For example, this Hungry Man Fried Chicken dinner has never made a disclosure on whether or not it is sourced from GMO ingredients, but the system programmatically identifies and communicates which ingredients are at high risk of coming from GMO crops (in this case, Corn, Canola, Sugar Beets). How Does Pinto Build their Database? To establish this type of highly personalized consumer-facing platform, Pinto built a unique new food database. Over the period of one and a half year, pinto has built the deepest database ever compiled in food from the ground up. For example, they've now chronicled every added sugar in American foods; every allergen/intolerance; every food that fits a diet like Whole 30; and they've made it all consumer-facing and searchable. They have a proprietary data engine that does this nuanced classification. For example, the engine can programmatically detect and classify added sugars, gluten ingredients/derivatives, products that fit a heart-healthy diet; etc. No one has ever built this data/classification layer and it's really unique technology in the space -- it also is what allows us to power deeper personalization for consumers. Pinto source the raw data from a number of sources: direct integrations with CPGs like Campbell’s, large-scale data ingestion work with retailers like Whole Foods & Kroger, and crowd-sourcing approaches from our community. Should you give Pinto a try? Absolutely, people are different in many ways and as such might differ in food requirements. This is why nutrition needs to be personalized or customized and that’s what Pinto is there for. To know more about Pinto, use this link to learn more or download their app on Itunes (for Apple users). If you find this article on how to personalize nutrition useful, please do share with families and friends and don’t forget to subscribe for future updates, reviews, and giveaways. 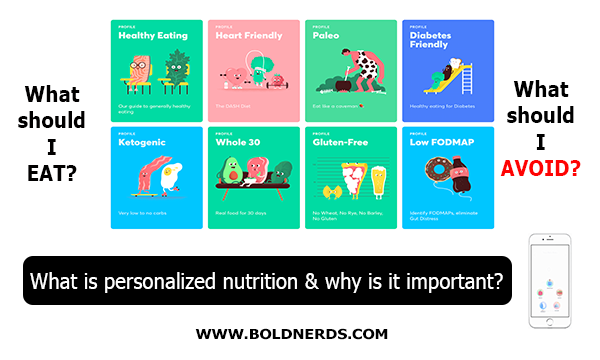 Bold Nerds : What is Personalized Nutrition and Why is it Important?